= Unio crassus Philipsson, 1788. — Bolotov et al. (2018). = Unio crassus Philipsson, 1788. — Zieritz et al. (2018). = Unio crassus. — Huang et al. (2018). = Unio crassus. — Burzynski et al. (2017). 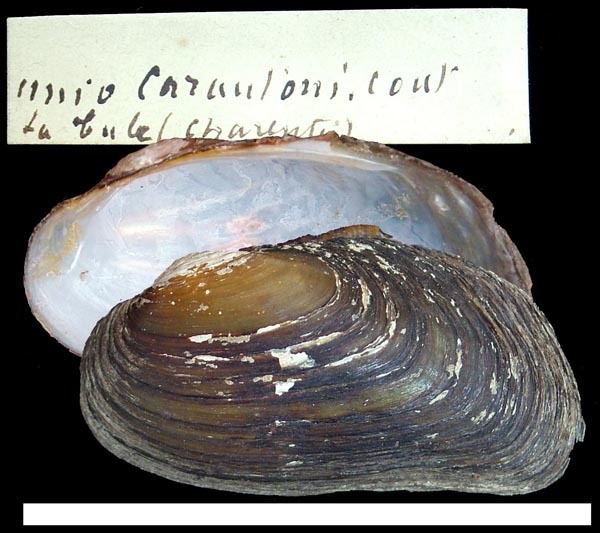 + Unio crassus courtillierii [sic] Hattemann, 1859. — Araujo et al. (2017). = Unio crassus Philipsson, 1788. — Lopes-Lima et al. (2017). = Unio crassus Philipsson, 1788. — Bolotov et al. (2017). = Unio crassus Retzius, 1788. — Araujo et al. (2017). = Unio crassus. — Lopes-Lima et al. (2017). Schröter, 1779, Gesch. Flußconch. : 182, pl. 2, fig. 2 [Mya testa crassa]. Philipsson in Retzius, 1788, Diss. Nat.-Hist. Test. Gen.: 17. Lister, 1678, Hist. Anim. Anglic. : pl. 2, fig. 30; [app.] pl. 1, fig. 4 [pre-linnaean]. 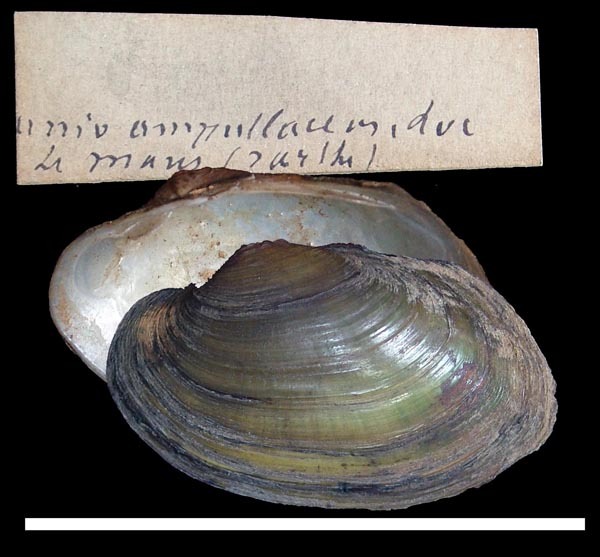 Lister, 1685, Conch. : pl. 146, fig. 1; pl. 147, figs. 2-3 [pre-linnaean]. Schröter, 1779, Gesch. Flußconch. : pl. 2, fig. 2; pl. 3, figs. 2-5; pl. 4, fig. 6. Martini & Chemnitz, 1782, Conchyl. Cab. : 19, pl. 1, fig. 6. Gmelin, 1791, Syst. Nat. : 3218, sp. 3. Spengler, 1793, Skr. Naturhist. Selsk. : 67, no. 32. ‘Linn.’ Draparnaud, 1806, Hist. Moll. France: pl. 11, fig. 5. ‘Linn.’ Draparnaud, 1806, Hist. Moll. France: 131, pl. 11, figs. 3 [var. B] [in part]. Mya batava Maton & Rackett, 1807. Schröter, 1779, Gesch. Flußconch. : pl. 3, figs. 2, 4-5. Maton & Rackett, 1807, Trans. Linn. Soc. London: 37. ‘Solander’ Dillwyn, 1817, Descr. Cat. Rec. Shells: ??. Lamarck, 1819, Hist. Natur. Anim. sans Vert. : 76, sp. 27. Studer, 1820, Naturw. Anz. Schweiz. Ges. Ges. Naturwiss. : 93 [nomen nudum]. Studer, 1820, Naturw. Anz. Schweiz. Ges. Ges. Naturwiss. : 93. Bruguière, 1797, Encycl. Méth. : pl. 249, fig. 4a-b [as Unio sp.]. Pfeiffer, 1821, Syst. Anord. Land Wasser. Moll. : 118, pl. 5, fig. 13. Scholtz, 1843, Land- und Wassermoll. Schlesiens: 129 [nomen nudum]. Pfeiffer, 1821, Syst. Anord. Land Wasser. Moll. : 117, pl. 5, fig. 12. Rossmässler, 1853, Z. Malak. : 92. Mörch, 1863, Vidensk. Medd. Naturhist. Foren. Kjöben.: . Nilsson, 1822, Hist. Moll. Suec. : 107. ‘Retzius’ Nilsson, 1822, Hist. Moll. Suec. : 108. Unio mytiloides Bory de St. Vincent, 1827. ‘Val.’ Bory de St. Vincent, 1827, Encycl. Méth. : 151. Menke, 1828, Syn. Method. Moll. : 64, 90. Menke, 1830, Syn. Method. Moll. : 107, 149. Menke, 1830, Syn. Method. Moll. : 149. Kokeil, 1831, Mich. Comp. : pl. 16, fig. 36. Fitzinger, 1833, Syst, Verz. Österr. Weichth. : 119. Küster, 1833, Icon. Moll. Test., Abt. 2 Moll. Terr. Fluv. : pl. 5, fig. 3. Fitzinger, 1833, Syst, Verz. Österr. Weichth. : 119 [nomen nudum]. Küster, 1833, Icon. Moll. Test., Abt. 2 Moll. Terr. Fluv. : pl. 5, fig. 5. Rossmässler, 1835, Icon. Land- und Süssw.-Moll. : 22, pl. 9, fig. 131. Rossmässler, 1837, Icon. Land- und Süssw.-Moll. : 21, pl. 24, fig. 339. ‘Ziegler’ Rossmässler, 1835, Icon. Land- und Süssw.-Moll. : 21. ‘Stenz’ Rossmässler, 1835, Icon. Land- und Süssw.-Moll. : 21. Rossmässler, 1835, Icon. Land- und Süssw.-Moll. : 20. ‘Ziegl.’ Rossmässler, 1836, Icon. Land- und Süssw.-Moll. : 31, pl. 15, fig. 212. ‘Schmidt’ Rossmässler, 1836, Icon. Land- und Süssw.-Moll. : 28, pl. 15, figs. 206-207. ‘Z.’ Rossmässler, 1835, Icon. Land- und Süssw.-Moll. : 21. ‘Ziegl.’ Rossmässler, 1836, Icon. Land- und Süssw.-Moll. : 30, pl. 15, fig. 209. Lea, 1836, Synopsis Fam. Naiades: 27. Schlüter, 1838, Kurzgef. Syst. Verz. Conch. Samml. : 33. J.F. Schmidt, 1840, Bull. Soc. Nat. Moscow: 435. C.B. Adams, 1847, Cat. Gen. Sp. Adams: 14. Lea, 1852, Synopsis Fam. Naiades: 30. Lea, 1870, Synopsis Fam. Naiades: 47. Schröder, 1885, Bull. Soc. Malac. France: 229. Servain, 1888, Bull. Soc. Malac. France: 317. Locard, 1889, Contr. Faune Malacol. Franc. : 141 . Germain, 1904, Bull. Soc. Sci. Nat. Ouest France: 264. Germain, 1931, Faune de France: 728. ‘Ziegl.’ Rossmässler, 1836, Icon. Land- und Süssw.-Moll. : 29, pl. 15, fig. 208. ‘Ziegl.’ Rossmässler, 1838, Icon. Land- und Süssw.-Moll. : 42, pl. 40, fig. 544. Rossmässler, 1842, Icon. Land- und Süssw.-Moll. : 14, pl. 55, fig. 742. ‘Ziegler’ Rossmässler, 1836, Icon. Land- und Süssw.-Moll. : 30, pl. 15, fig. 211. ‘Zieg.’ Lea, 1836, Synopsis Fam. Naiades: 27. ‘Mühl. Pfeif.’ Lea, 1836, Synopsis Fam. Naiades: 27. ‘Ziegl.’ Rossmässler, 1836, Icon. Land- und Süssw.-Moll. : 30, pl. 15, fig. 210. ‘Schmidt’ Rossmässler, 1836, Icon. Land- und Süssw.-Moll. : 31, pl. 15, fig. 213. Held, 1836, Isis (Oken): 281. Unio batavus var. 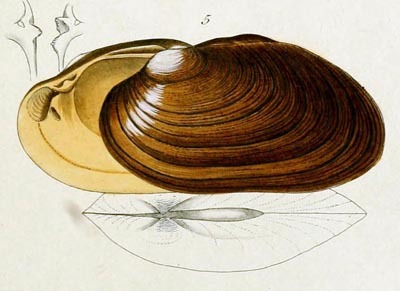 elongatus Held, 1836. Held, 1836, Isis (Oken): 306. Unio batavus var. 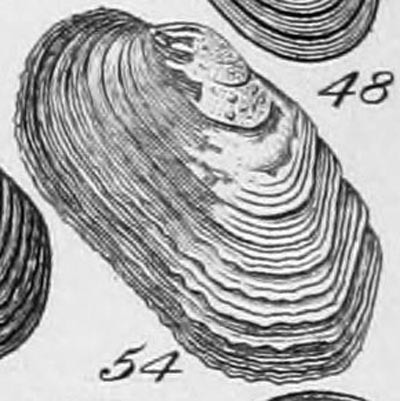 gibbosus Held, 1836. Unio batvus var. ovatus Charpentier, 1837. Studer, 1820, Naturw. Anz. Schweiz. Ges. Ges. Naturwiss. : 94 [nomen nudum]. ‘Studer’ Charpentier, 1837, Cat. Moll. Suisse: 24, pl. 2, figs. 20a-b. Rossmässler, 1837, Icon. Land- und Süssw.-Moll. : 56, pl 29., fig. 413 [as ‘Unio an n. sp. ?’] [nomen nudum]. Unio batavus var. 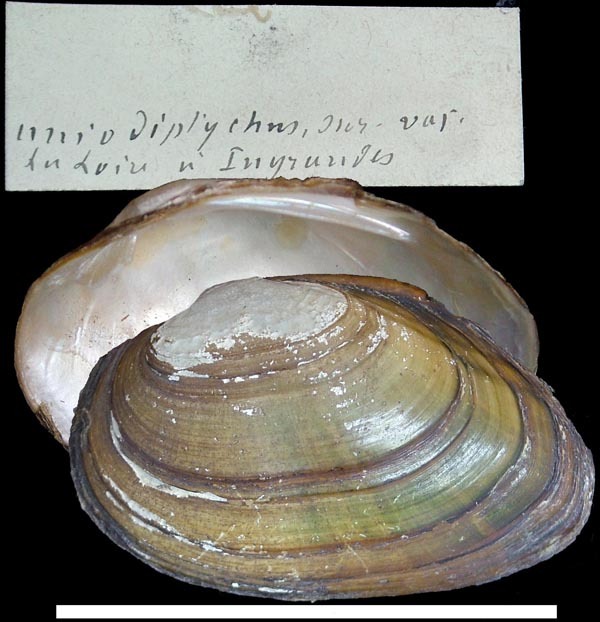 sinuatus Charpentier, 1837. Studer, 1820, Naturw. Anz. Schweiz. Ges. Ges. Naturwiss. : 24 [nomen nudum]. Charpentier, 1837, Cat. Moll. Suisse: 24, pl. 2, fig. 21. Unio batavus var. 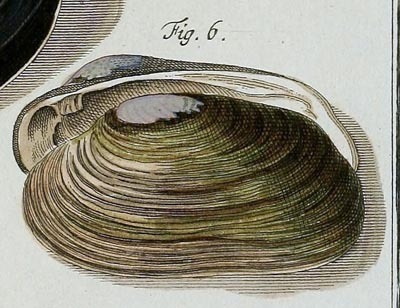 squamosus Charpentier, 1837. Charpentier, 1837, Cat. Moll. Suisse: 25, pl. 2, fig. 22. Mysca batava var. fuscula subvar. pallipes Schlüter, 1838. ‘Ziegl.’ Schlüter, 1838, Kurzgef. Syst. Verz. Conch. Samml. : 33 [infra-subsp.]. Mysca reniformis subvar. kokeilli Schlüter, 1838. Schlüter, 1838, Kurzgef. Syst. Verz. Conch. Samml. : 32 [infra-subsp.]. Rossmässler, 1838, Icon. Land- und Süssw.-Moll. : 26, pl. 35, fig. 493. Unio consentaneus legitimus Rossmässler, 1838. Rossmässler, 1838, Icon. Land- und Süssw.-Moll. : 25, pl. 35, fig. 491a [infra-subsp.]. Unio consentaneus minor Rossmässler, 1838. Rossmässler, 1838, Icon. Land- und Süssw.-Moll. : 25, pl. 35, fig. 491c [infra-subsp.]. Unio consentaneus pulcher Rossmässler, 1838. Rossmässler, 1838, Icon. Land- und Süssw.-Moll. : 25, pl. 35, fig. 491b [infra-subsp.]. Mauduyt, 1839, Tableau Indic. Moll. Vienne: 8, pl. 1, fig. 1. 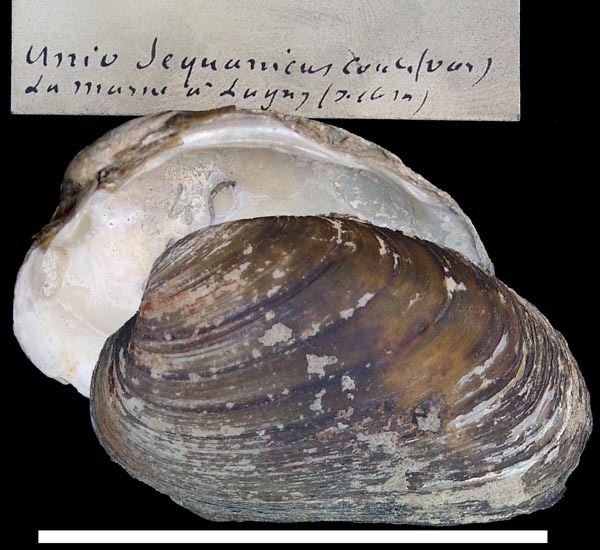 Unio gangrenosus J.F. Schmidt, 1840. ‘Ziegler’ J.F. Schmidt, 1840, Bull. Soc. Nat. Moscow: 436. J.F. Schmidt, 1847, Conch. Krain: 26. Unio pruinosus J.F. Schmidt, 1840. J.F. Schmidt, 1840, Bull. Soc. Nat. Moscow: 445, pl. 9, fig. 3. Unio littoralis var. minor Rossmässler, 1842. Rossmässler, 1842, Icon. Land- und Süssw.-Moll. : 14, pl. 55, figs. 744 [in part]. Schlüter, 1838, Kurzgef. Syst. Verz. Conch. Samml. : 33 [as ‘Mysca tumida var. crassissima’] [nomen nudum]. 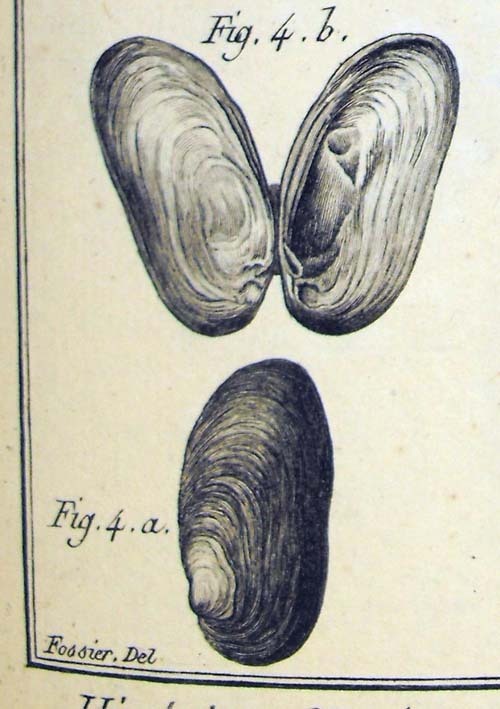 ‘Fer.’ Hanley, 1843, Illustr. Descr. Cat. Rec. 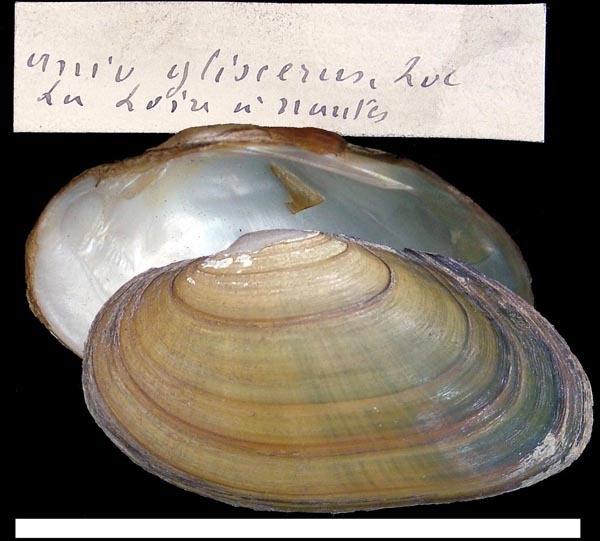 Bivalve Shells: 209. Millet, 1843, Mag. Zool. : 4, pl. 64, fig. 2. ‘Mich.’ Rossmässler, 1844, Icon. Land- und Süssw.-Moll. : 29, pl. 57, fig. 757-761. Unio batavus var. pusillus Rossmässler, 1844. Rossmässler, 1844, Icon. Land- und Süssw.-Moll.: . Stabile, 1845, Faun. Lug. : f. 75. Unio piscinalis J.F. Schmidt, 1847. J.F. Schmidt, 1847, Conch. Krain: 27. Unio retzii C.B. Adams, 1847. ‘Küst.’ C.B. Adams, 1847, Cat. Gen. Sp. Adams: 14 [nomen nudum]. Dupuy, 1849, Cat. Extramar. Galliae Test. : no. 326. Dupuy, 1852, Hist. Natur. Moll. France: 639, pl. 24, fig. 12. Unio moquinianus Sandberger & Koch, 1851. Sandberger & Koch, 1851, Jb. Nassau. Ver. Naturk. : 245. ‘Küst.’ Lea, 1852, Synopsis Fam. Naiades: 30. ‘Dup.’ Lea, 1852, Synopsis Fam. Naiades: 39. Drouet, 1852, Etudes Nayades de la France: pl. 6, fig. 3. ‘Lamarck’ Dupuy, 1852, Hist. Natur. Moll. France: pl. 25, fig. 16. Dupuy, 1852, Hist. Natur. Moll. France: pl. 25, fig. 13. ‘Zieg.’ Lea, 1852, Synopsis Fam. Naiades: 30. Küster, 1854, Conchyl. Cab. : 119, pl. 32, fig. 5. Küster, 1854, Conchyl. Cab. : 116, pl. 31, fig. 6. Küster, 1854, Conchyl. Cab. : 120, pl. 33, figs. 1-3. Küster, 1854, Conchyl. Cab. : 103, pl. 28, figs. 1-2. ‘Retz.’ Küster, 1854, Conchyl. Cab. : 113, pl. 31, fig. 5 [in part]. Küster, 1854, Conchyl. Cab. : 111, pl. 30, fig. 5-7. ‘Nilss.’ Moquin-Tandon, 1855, Hist. Natur. Moll. France: 570. Küster, 1855, Conchyl. Cab. : 125, pl. 34, figs. 5-6 [in part]. Sowerby, 1868, Conch. Icon. : pl. 75, sp. 392. Küster, 1855, Conchyl. Cab. : 124. Westerlund, 1890, Fauna Paläarct. Binnenconch. : 81. Haas, 1940, Zool. Ser. Field Mus. Nat. Hist. : 130. Haas, 1969, Das Tierreich: 46. Rossmässler, 1844, Icon. Land- und Süssw.-Moll. : fig. 414. Moquin-Tandon, 1855, Hist. Natur. Moll. France: 571. Unio batavus var. 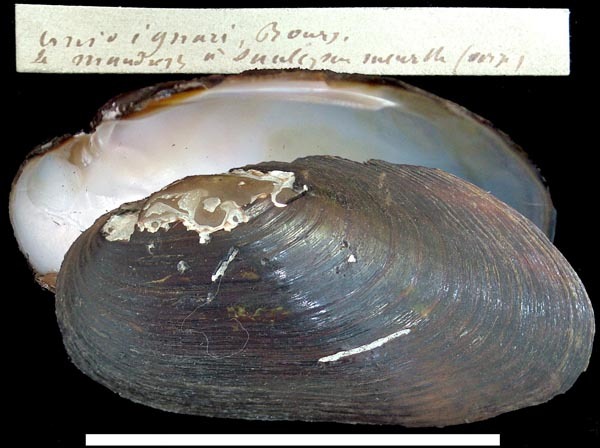 sarratinus Moquin-Tandon, 1855. ‘St. Germain, in litt.’ Moquin-Tandon, 1855, Hist. Natur. Moll. France: 571. Bourguignat, 1856, Aménités Malacol. : 33, pl. 4, figs. 1-4. ‘Nilss.’ Drouët, 1857, Étud. Naïades. France, Unio: 72, pl. 4, fig. 1. ‘Lam.’ Drouët, 1857, Étud. Naïades. France, Unio: pl. 5, fig. 2. ‘Dup.’ Drouët, 1857, Étud. Naïades. France, Unio: 100, pl. 9, fig. 1. Unio batavus var. longus de Joannis, 1859.
de Joannis, 1859, Ann. Soc. Linn. Maine-et-Loire: 288, pl. 10, fig. 3. Unio batavus var. minimus de Joannis, 1859.
de Joannis, 1859, Ann. Soc. Linn. Maine-et-Loire: 289, pl. 9, fig. 6. Unio batavus var. nanus de Joannis, 1859.
de Joannis, 1859, Ann. Soc. Linn. Maine-et-Loire: pl. 9, fig. 8 [in part]. de Joannis, 1859, Ann. Soc. Linn. Maine-et-Loire: pl. 9, fig. 10 [in part]. Unio batavus var. ovalis de Joannis, 1859.
de Joannis, 1859, Ann. Soc. Linn. Maine-et-Loire: pl. 10, fig. 2. Unio batavus var. senotius de Joannis, 1859.
de Joannis, 1859, Ann. Soc. Linn. Maine-et-Loire: 288, pl. 10, fig. 4. Unio batavus de Joannis, 1859.
de Joannis, 1859, Ann. Soc. Linn. Maine-et-Loire: pl. 9, fig. 2 [in part]. Hattemann, 1859, Ann. Soc. Linn. Maine-et-Loire: 232. Unio batavus var. acutus de Joannis, 1859.
de Joannis, 1859, Ann. Soc. Linn. Maine-et-Loire: 287, pl. 10, fig. 1. Unio batavus var. baraceus de Joannis, 1859.
de Joannis, 1859, Ann. Soc. Linn. Maine-et-Loire: 285, pl. 9, fig. 7. Unio batavus var. courtilieri de Joannis, 1859.
de Joannis, 1859, Ann. Soc. Linn. Maine-et-Loire: pl. 9, fig. 3. ‘Parreis in sched.’ Küster, 1862, Conchyl. Cab. : 267. Bourguignat, 1862, Malacol. Lac Quatre-Cantons: 55. Bourguignat, 1864, Malac. Aix-les-Baines: 76. Bourguignat, 1864, Malac. Aix-les-Baines: 73. Jay, 1839, Cat. Rec. Shells: 25, sp. 1065. ‘Walsh.’ Lea, 1852, Synopsis Fam. Naiades: [nomen nudum]. 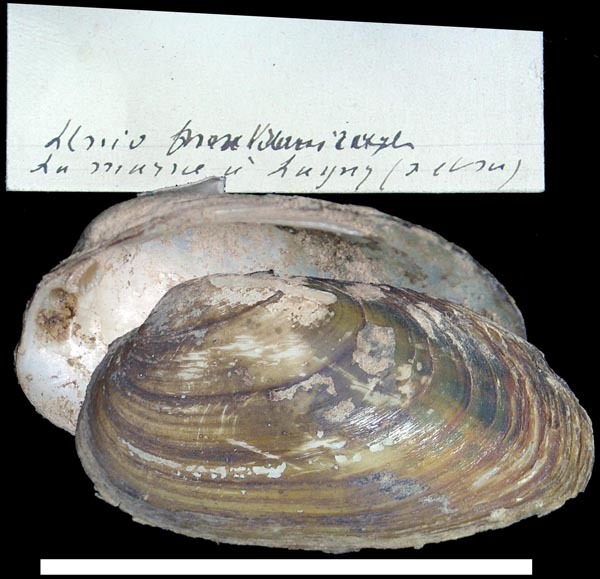 ‘Watts’ Reeve, 1865, Conch. Icon. : pl. 28, sp. 145. Malzine, 1867, Matér. Faune Malacol. Belg. : 33, pl. 2, figs, 3-4. Malzine, 1867, Matér. Faune Malacol. Belg. : 32, pl. 2, figs. 1-2. Unio batavus var. 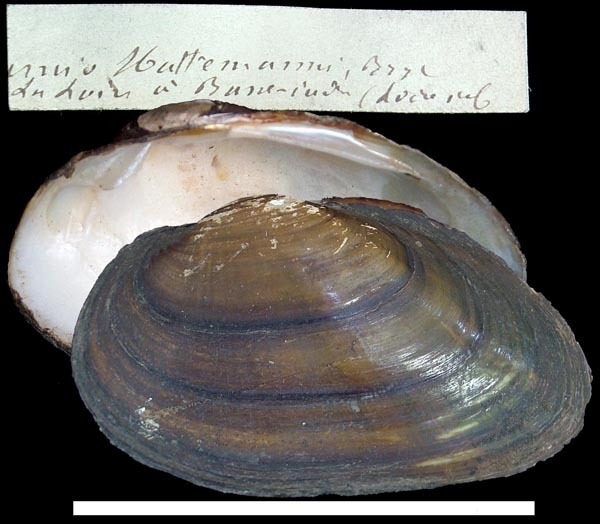 squamosus Brot, 1867. Brot, 1867, Assoc. Zool. Léman Ann. : pl. 9, fig. 1. Unio ryckholti var. 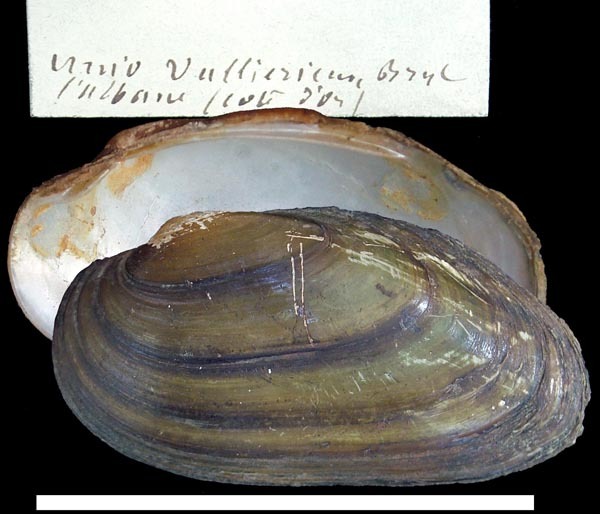 cuneata Malzine, 1867. Malzine, 1867, Matér. Faune Malacol. Belg. : 32. Unio (tumidus) elegans Westerlund, 1867. Westerlund, 1867, Malak. Blatt. : 202, 206. Unio batavus var. belgicus Colbeau, 1868. Colbeau, 1868, Ann. Soc. Roy. Zool. Malac. Belgique: 106, pl. 4, fig. 3. ‘Pfeif. Mühl.’ Lea, 1870, Synopsis Fam. Naiades: 47. ‘Bourg.’ Lea, 1870, Synopsis Fam. Naiades: 48. ‘Bourg.’ Lea, 1870, Synopsis Fam. Naiades: 46. Unio crassus var. maximus Kobelt, 1872. Kobelt, 1872, Malak. Blatt. : 142, pl. 5. Kobelt, 1884, Icon. Land- und Süssw.-Moll. : 67, pl. 29, figs. 218-219. Miller, 1873, Schalth. Bodensees: pl. 2, fig. 8. Möllendorff, 1874, Beitr. Fauna Bosniens: 62, text figs. 21-22. Clessin, 1875, Verh. Ver. Naturgesch. Hamburg: 258. ‘Parr.’ Lea, 1870, Synopsis Fam. Naiades: 48 [nomen nudum]. ‘Parreyss, in sched.’ Drouët, 1879, J. de Conch. : 141. ‘Held’ Kobelt, 1879, Icon. Land- und Süssw.-Moll. : 44, pl. 163, fig. 1649. Drouët, 1879, J. de Conch. : 142. Unio vescoi var. conemenosi Westerlund & Blanc, 1879. Blanc in Westerlund & Blanc, 1879, Aperçu Faune Malac. Grèce: 145. Brevière, 1880, Cat. moll. Nièvre: 26. ‘Mich.’ Brevière, 1880, Cat. moll. Nièvre: 26. ‘Held’ Drouët, 1881, J. de Conch. : 27. Drouët, 1881, J. de Conch. : 247. 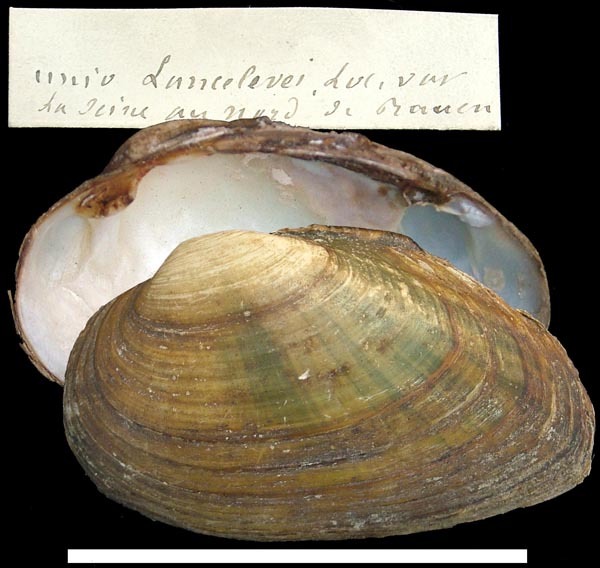 Drouët, 1881, Unionidae Russie: 17. 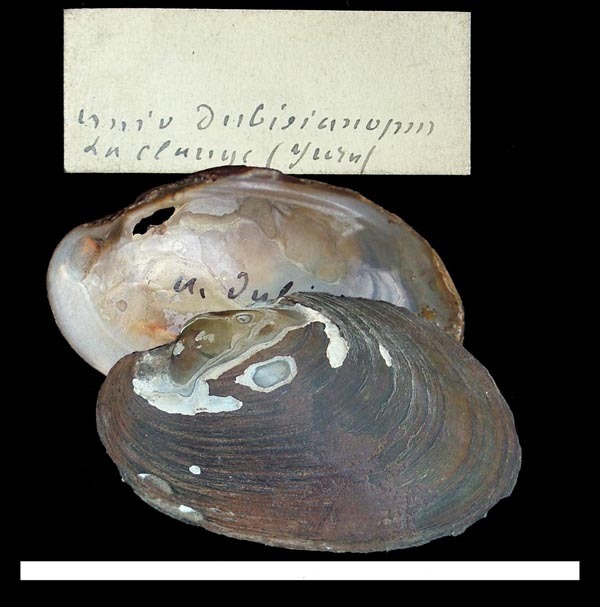 Drouët, 1881, Unionidae Russie: 15. Krynicki, 1837, Bull. Soc. imp. Nat. Moscou: 59 [nomen nudum]. ‘Krynicki’ Drouët, 1881, J. de Conch. : 24. 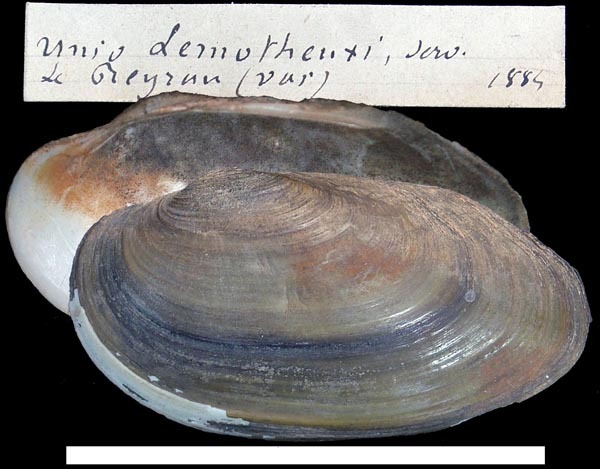 ‘Krynicki’ Drouët, 1881, Unionidae Russie: 14. Drouet, 1884, Suppl. Unionidae de Serbie: pls. 1-2. 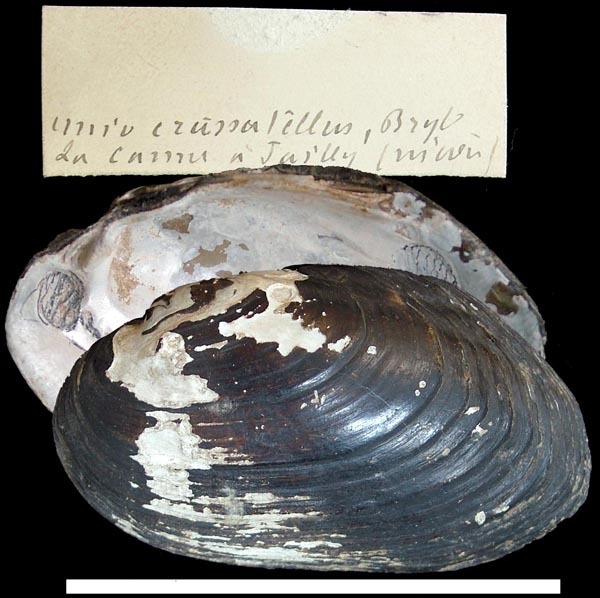 Drouët, 1881, Unionidae Russie: 18. Drouët, 1881, J. de Conch. : 245. ‘Coutagne’ Locard, 1882, Prodr. Malac. Franç. : 291 [as ‘dubisanus’], 360. ‘Coutagne’ Locard, 1889, Contr. Faune Malacol. Franc. : 129 . ‘Coutagne’ Locard, 1893, Coqu. Eau Douce Saumâtre France: 158. 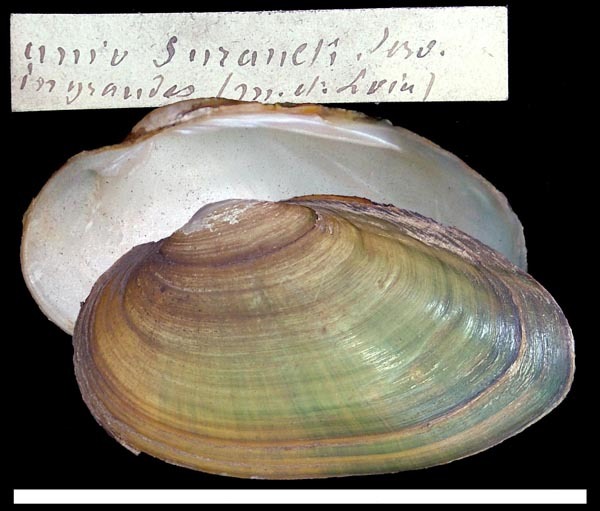 Type(s): SYNTYPE MNHN_22198, La Clange (Jura). Bourguignat in Locard, 1882, Prodr. Malac. Franç. : 286, 355. ‘Bourguignat’ Locard, 1889, Contr. Faune Malacol. Franc. : 134 . ‘Bourguignat’ Locard, 1893, Coqu. Eau Douce Saumâtre France: 161. Locard, 1882, Prodr. Malac. Franç. : 291 [as ‘dubisopsis’], 360. Locard, 1889, Contr. Faune Malacol. Franc. : 128  [as ‘dubisianopsis’]. Locard, 1893, Coqu. Eau Douce Saumâtre France: 155 [as ‘dubisianopsis’]. 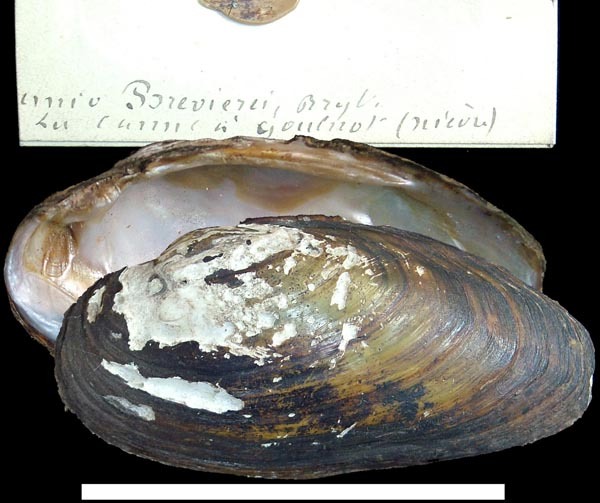 Drouet, 1882, Unionidae de Serbie: 19. Locard, 1882, Prodr. Malac. Franç. : 291. Drouet, 1882, Unionidae de Serbie: 12. Bourguignat in Locard, 1882, Prodr. Malac. Franç. : 285, 355. Bourguignat in Locard, 1889, Contr. Faune Malacol. Franc. : 134 . Bourguignat in Locard, 1893, Coqu. Eau Douce Saumâtre France: 161, fig. 175. Bourguignat in Locard, 1899, Conchyliol. Portug. : 217. 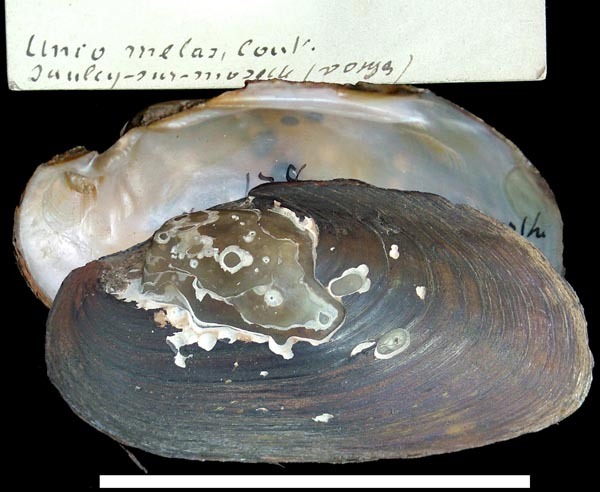 Type(s): POSSIBLE SYNTYPE MNHN_22215, La Moselle. ‘Bourguignat’ Locard, 1889, Contr. Faune Malacol. Franc. : 142 . ‘Bourguignat’ Locard, 1893, Coqu. Eau Douce Saumâtre France: 169. Type(s): IDIOTYPE MNHN_22310, La Loire à Ingrandes. Bourguignat in Locard, 1882, Prodr. Malac. Franç. : 287, 356. ‘Bourguignat’ Locard, 1889, Contr. Faune Malacol. Franc. : 138 . ‘Bourguignat’ Locard, 1893, Coqu. Eau Douce Saumâtre France: 164, fig. 178. Type(s): IDIOTYPE MNHN_22316, l’Albane (Côte-d’Or). Bourguignat in Locard, 1882, Prodr. Malac. Franç. : 292, 361. ‘Bourguignat’ Locard, 1889, Contr. Faune Malacol. Franc. : 132 . ‘Bourguignat’ Locard, 1893, Coqu. Eau Douce Saumâtre France: 158, fig. 172. 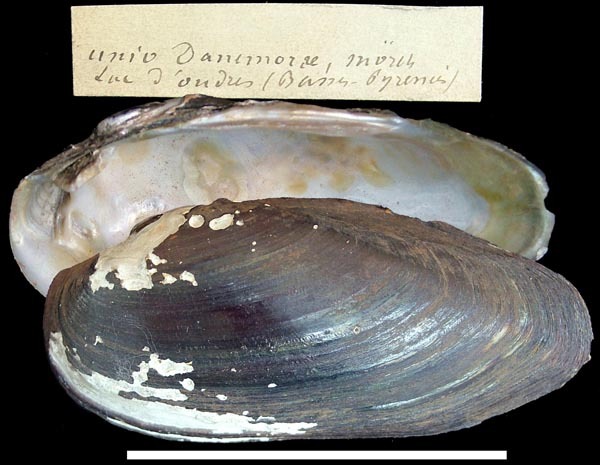 Type(s): LECTOTYPE MNHN_22326 (selected by Graf, 2011), lac du Bourget. ‘Servain’ Locard, 1882, Prodr. Malac. Franç. : 289, 359. ‘Servain’ Locard, 1889, Contr. Faune Malacol. Franc. : 142 . ‘Servain’ Locard, 1893, Coqu. Eau Douce Saumâtre France: 167. Type(s): POSSIBLE SYNTYPE MNHN_22100, La Maine à Angers. ‘Bourguignat’ Locard, 1889, Contr. Faune Malacol. Franc. : 143 . ‘Bourguignat’ Locard, 1893, Coqu. Eau Douce Saumâtre France: 170. Type(s): LECTOTYPE MNHN_22355 (selected by Graf, 2011), La Marne à Lagny (Seine-et-Marne). Bourguignat in Locard, 1889, Contr. Faune Malacol. Franc. : 144 . Bourguignat in Locard, 1893, Coqu. Eau Douce Saumâtre France: 171. 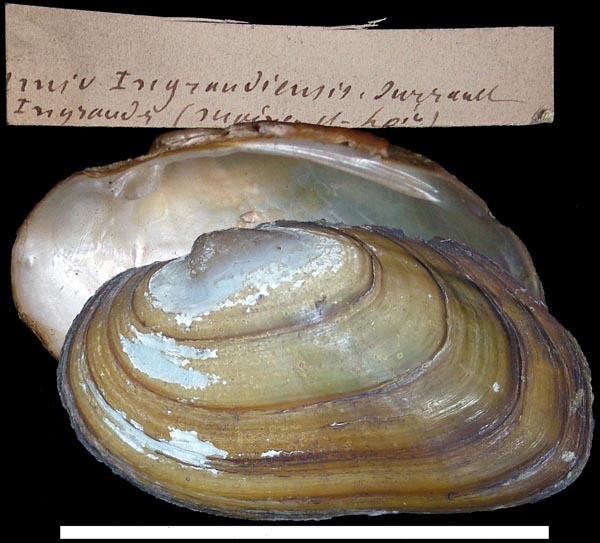 Type(s): IDIOTYPE MNHN_22110, Basse Indre (Loire-Inf.). Coutagne in Locard, 1882, Prodr. Malac. Franç. : 285, 355. ‘Coutagne’ Locard, 1889, Contr. Faune Malacol. Franc. : 128 . ‘Coutagne’ Locard, 1893, Coqu. Eau Douce Saumâtre France: 155, fig. 169. 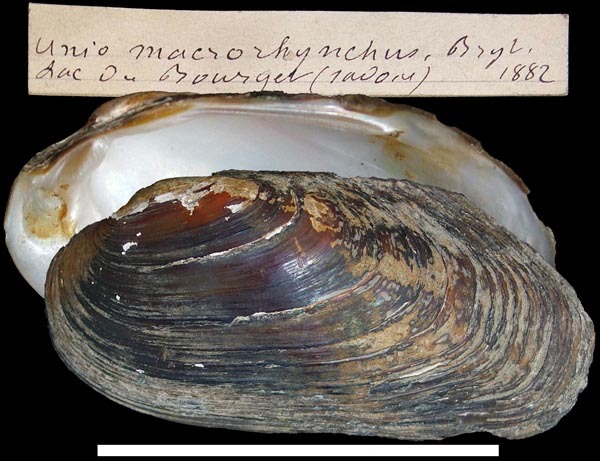 Type(s): SYNTYPE MNHN_22363, Saulcy-sur-Meurthe (Vosges) [written on shell]. ‘Bourguignat’ Locard, 1882, Prodr. Malac. Franç. : 286 [as ‘brevieri’], 356. ‘Bourguignat’ Locard, 1889, Contr. Faune Malacol. Franc. : 148 . ‘Bourguignat’ Locard, 1893, Coqu. Eau Douce Saumâtre France: 178. Type(s): LECTOTYPE MNHN_22145 (selected by Graf, 2011), La Canne, à Goulnot. ‘Ray’ Locard, 1882, Prodr. Malac. Franç. : 290 [nomen nudum]. ‘Bourguignat in Locard’ Of Authors. Locard, 1882, Prodr. Malac. Franç. : 286. Germain, 1904, Bull. Soc. Sci. Nat. Ouest France: 265. Germain, 1931, Faune de France: 732. Haas, 1969, Das Tierreich: 49. ‘Brevière’ Locard, 1889, Contr. Faune Malacol. Franc. : 149 . ‘Brevière’ Locard, 1893, Coqu. Eau Douce Saumâtre France: 180. 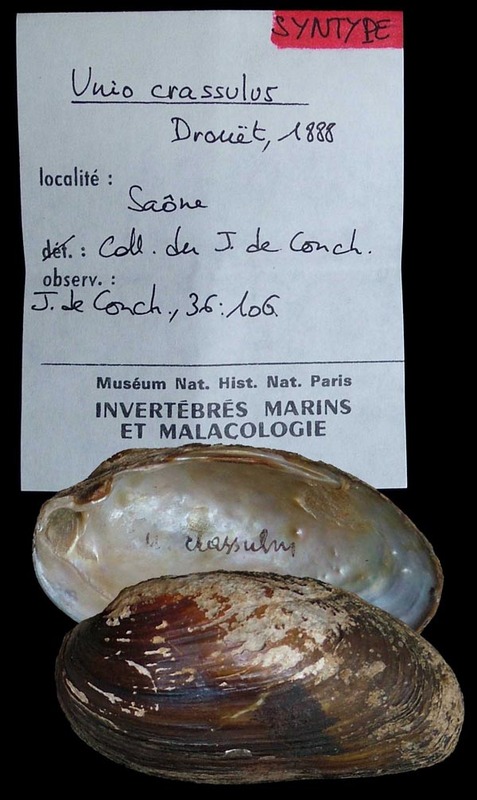 Type(s): LECTOTYPE MNHN_22438 (selected by Graf, 2011), La Canne, dans la Nièvre. Bourguignat in Locard, 1882, Prodr. Malac. Franç. : 295, 364. ‘Coutagne’ Locard, 1893, Coqu. Eau Douce Saumâtre France: 157. 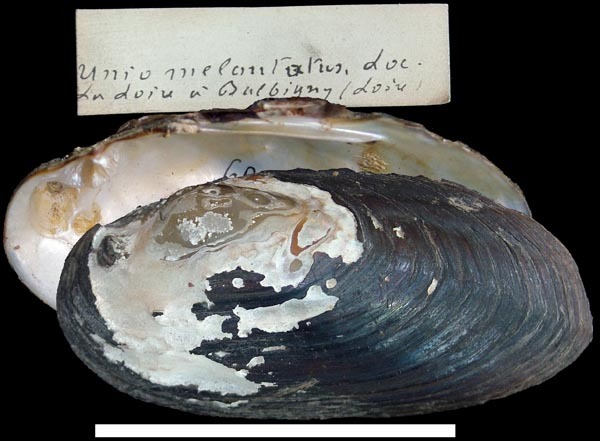 Type(s): IDIOTYPE MNHN_22162, [illegible] (Charente). Bourguignat in Locard, 1882, Prodr. Malac. Franç. : 289, 359. ‘Bourguignat’ Locard, 1889, Contr. Faune Malacol. Franc. : 140 . Type(s): IDIOTYPE MNHN_22470, La Brizotte (Côte-d’Or). Bourguignat in Locard, 1882, Prodr. Malac. Franç. : 286, 356. Bourguignat in Locard, 1889, Contr. Faune Malacol. Franc. : 136 . Bourguignat in Locard, 1893, Coqu. Eau Douce Saumâtre France: 162. Type(s): LECTOTYPE MNHN_22182 (selected by Graf, 2011), La Canne, à Jailly (Nièvre). Locard, 1882, Prodr. Malac. Franç. : 292. 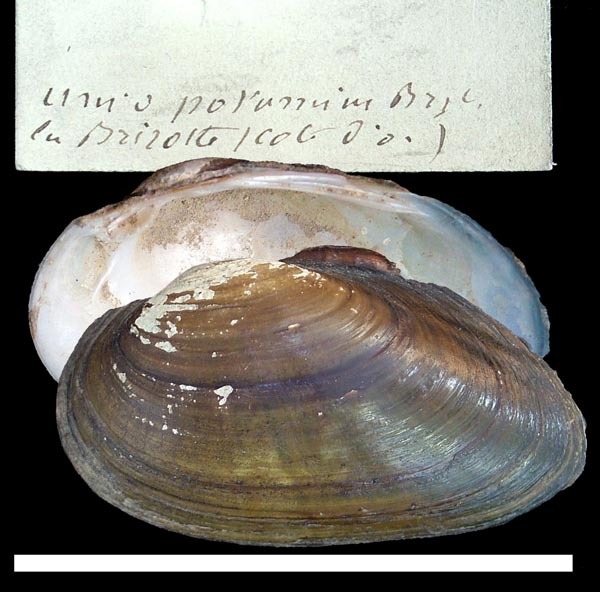 Drouet, 1882, Unionidae de Serbie: 15. Bourguignat in Locard, 1882, Prodr. Malac. Franç. : 284, 354 [as ‘danemoræ’]. ‘Mörch’ Locard, 1889, Contr. Faune Malacol. Franc. : 147  [as ‘danemoræ’]. ‘Mörch’ Locard, 1893, Coqu. Eau Douce Saumâtre France: 177 [as ‘danemoræ’]. 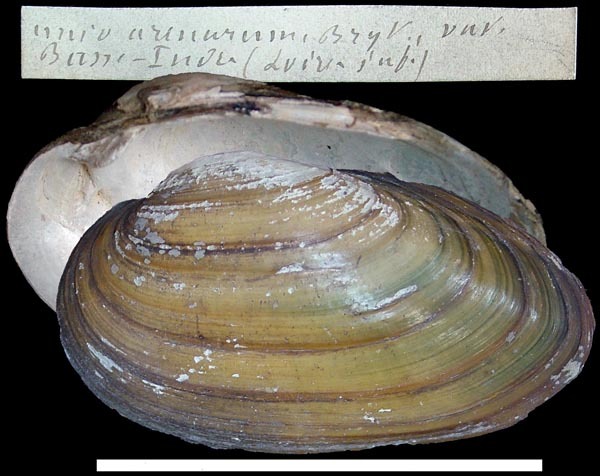 Type(s): IDIOTYPE MNHN_22186, lac d’Ondres (Baase-Pyrénées). Bourguignat in Locard, 1882, Prodr. Malac. Franç. : 284, 354. ‘Bourguignat’ Locard, 1889, Contr. Faune Malacol. Franc. : 149 . ‘Bourguignat’ Locard, 1893, Coqu. Eau Douce Saumâtre France: 181, fig. 194. Type(s): IDIOTYPE MNHN_22528, le Mandrezey, à Saulcy-sur-Meurthe (Vosges). ‘Coutagne’ Locard, 1882, Prodr. Malac. Franç. : 291. ‘Coutagne’ Locard, 1889, Contr. Faune Malacol. Franc. : 142 . ‘Coutagne’ Locard, 1893, Coqu. Eau Douce Saumâtre France: 169, fig. 183. Type(s): LECTOTYPE MNHN_22529 (selected by Graf, 2011), La Marne à Lagny (Seine-et-Marne). Drouet, 1884, Suppl. Unionidae de Serbie: 5, pl. 1, fig. 1. Drouet, 1884, Suppl. Unionidae de Serbie: 13. Drouet, 1884, Suppl. 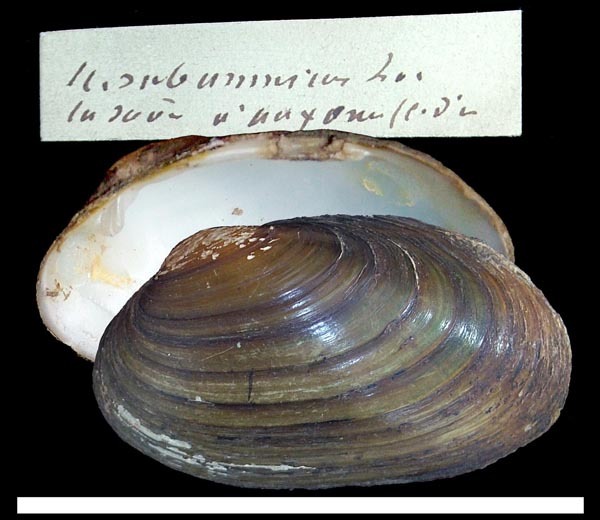 Unionidae de Serbie: 9, pl. 1, fig. 1. Drouet, 1884, Suppl. Unionidae de Serbie: 9. ‘Letourneux’ Locard, 1885, Bull. Soc. Sci. Nat. Rouen: 11. ‘Letourneux’ Locard, 1889, Contr. Faune Malacol. Franc. : 144 . ‘Letourneux’ Locard, 1893, Coqu. Eau Douce Saumâtre France: 170, fig. 184. Type(s): LECTOTYPE MNHN_22127 (selected by Graf, 2011), La Bouille, près de Rouen (Seine-Inf.). Servain, 1885, Bull. Soc. Malac. France: 331. ‘Brot, mss.’ Servain, 1885, Bull. Soc. Malac. France: 327. ‘Bourguignat, mss.’ Servain, 1885, Bull. Soc. Malac. France: 325. ‘Bourguignat, mss.’ Servain, 1885, Bull. Soc. Malac. France: 332. Servain, 1885, Bull. Soc. Malac. France: 329. Servain, 1885, Bull. Soc. Malac. France: 327. Unio batavus var. albensis Hazay, 1885. Hazay, 1885, Jb. Dtsch. Malak. Ges. : 43. Unio batavus var. 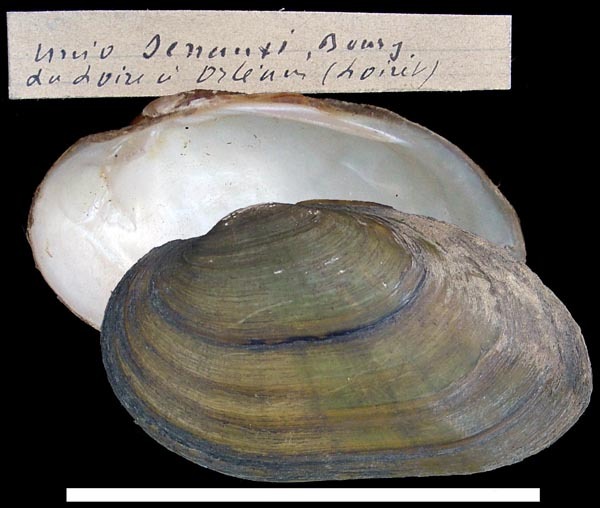 ondovensis Hazay, 1885. ‘Bourg.’ Kobelt, 1886, Icon. Land- und Süssw.-Moll. : 22, pl. 41, fig. 255. Sandberger & Koch, 1851, Jb. Nassau. Ver. Naturk. : 245 [as ‘U. 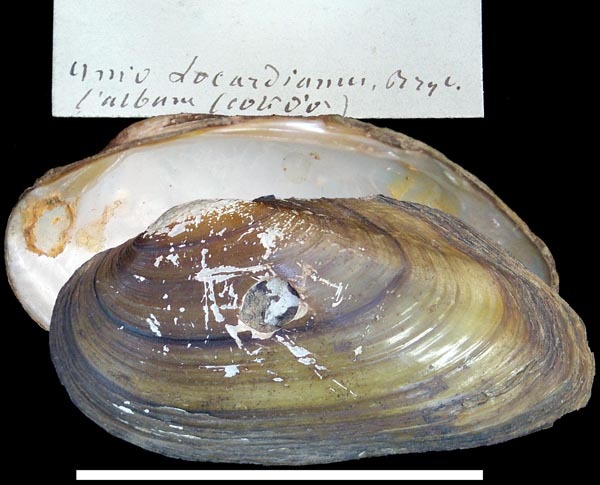 moquinianus’]. Kobelt, 1886, Icon. Land- und Süssw.-Moll. : 46, pl. 56, figs. 295-296. Kobelt, 1886, Jb. Nassau. Ver. Naturk. : 97, pl. 6, fig. 1. ‘Drouët’ Kobelt, 1886, Icon. Land- und Süssw.-Moll. : 34. Kobelt, 1886, Icon. Land- und Süssw.-Moll. : pl. 53, fig. 286. Unio batavus var. taunica Kobelt, 1886. Kobelt, 1886, Jb. Nassau. Ver. Naturk. : 96, pl. 7, fig. 5. Unio raddei var. koutaisiana Kobelt, 1886. Kobelt, 1886, Icon. Land- und Süssw.-Moll. : 40, pl. 52, fig. 283. Servain, 1887, Bull. Soc. Malac. France: 254. Sourbieu, 1887, Bull. Soc. Malac. France: 235. Drouet, 1888, J. de Conch. : 107. Drouët, 1889, Mém. Acad. Sci. Dijon: 76, pl. 1, fig. 4. Folin, 1888, Le Naturaliste: 273, 4 text figs..
Drouet, 1888, J. de Conch. : 106. Drouët, 1889, Mém. Acad. Sci. Dijon: 66, pl. 2, fig. 5. ‘Bourguignat’ Servain, 1888, Bull. Soc. Malac. France: 316, footnote [nomen nudum]. Locard, 1889, Contr. Faune Malacol. Franc. : 136 , footnote [nomen nudum]. Servain, 1888, Bull. Soc. Malac. France: 315. ‘Ray’ Locard, 1882, Prodr. Malac. Franç. : 290 [as ‘Unio minutus’] [nomen nudum]. ‘Ray’ Servain, 1888, Bull. Soc. Malac. France: 316. Bourguignat in Servain, 1888, Bull. Soc. Malac. France: 317. Servain, 1888, Bull. Soc. Malac. France: 316. ‘Servain’ Locard, 1889, Contr. Faune Malacol. Franc. : 146 , 211 . ‘Servain’ Locard, 1893, Coqu. Eau Douce Saumâtre France: 175, fig. 188. 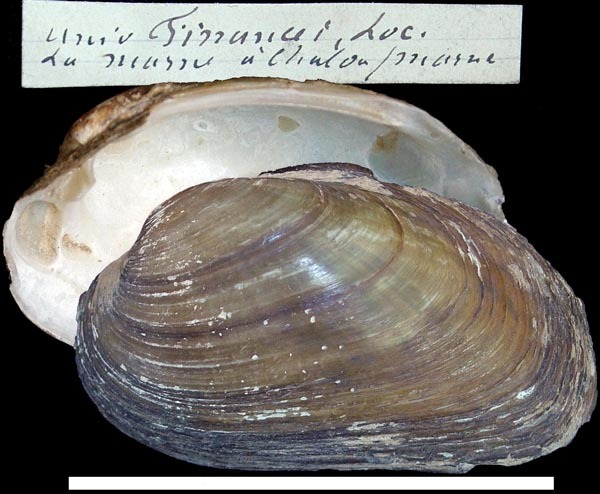 Type(s): LECTOTYPE MNHN_22085 (selected by Graf, 2011), La Loire a Basse Indre (Loire-Inf.). ‘Dup.’ Drouët, 1857, Étud. Naïades. France, Unio: 100, pl. 9, fig. 1 [as ‘U. platyrhynchoideus’]. Bourguignat in Locard, 1889, Contr. Faune Malacol. Franc. : 147 , 214 . ‘Bourguignat’ Locard, 1893, Coqu. Eau Douce Saumâtre France: 177. Bourguignat in Locard, 1889, Contr. Faune Malacol. Franc. : 144 , 204 . ‘Servain’ Locard, 1893, Coqu. Eau Douce Saumâtre France: 174 [as ‘suraulti’]. Type(s): SYNTYPE MNHN_22569, La Loire à Ingrandes. ‘Coutagne Mss. teste Bourguignat’ Locard, 1889, Contr. Faune Malacol. Franc. : 128  [nomen nudum]. Bourguignat in Locard, 1889, Contr. Faune Malacol. Franc. : 143 , 202 . ‘Sarault’ Locard, 1893, Coqu. Eau Douce Saumâtre France: 173. 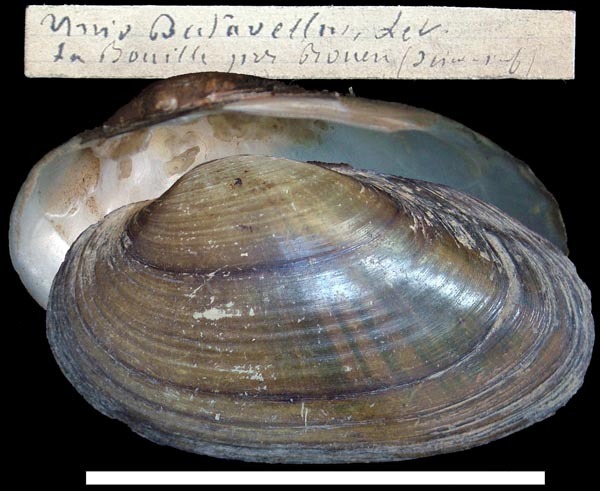 Type(s): POSSIBLE SYNTYPE MNHN_22282, Ingrandes (Maine-et-Loire). Bourguignat in Locard, 1889, Contr. Faune Malacol. Franc. : 139 , 199 . ‘Bourguignat’ Locard, 1893, Coqu. Eau Douce Saumâtre France: 165. 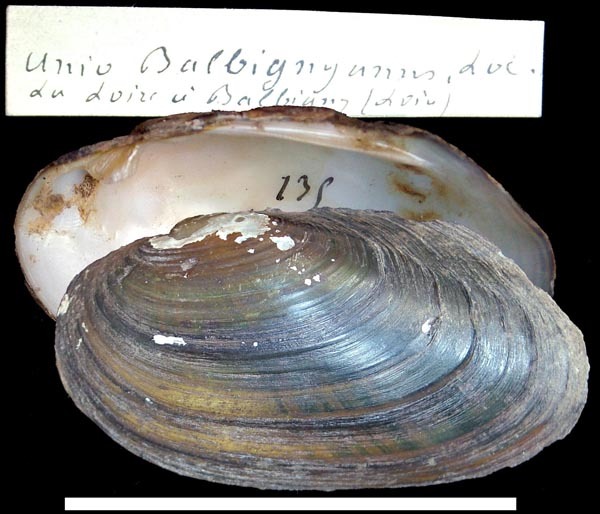 Type(s): SYNTYPE MNHN_22592, l’Albane (Côte-d’Or). Bourguignat in Locard, 1889, Contr. Faune Malacol. Franc. : 138 , 196 . Bourguignat in Locard, 1893, Coqu. Eau Douce Saumâtre France: 165. Type(s): LECTOTYPE MNHN_22101 (selected by Graf, 2011), le Gouet, à Saint-Brieue (Côtes-du-Nord). Locard, 1889, Contr. Faune Malacol. Franc. : 129 , 187 . Locard, 1893, Coqu. Eau Douce Saumâtre France: 157, fig. 171 [as ‘juranus’]. 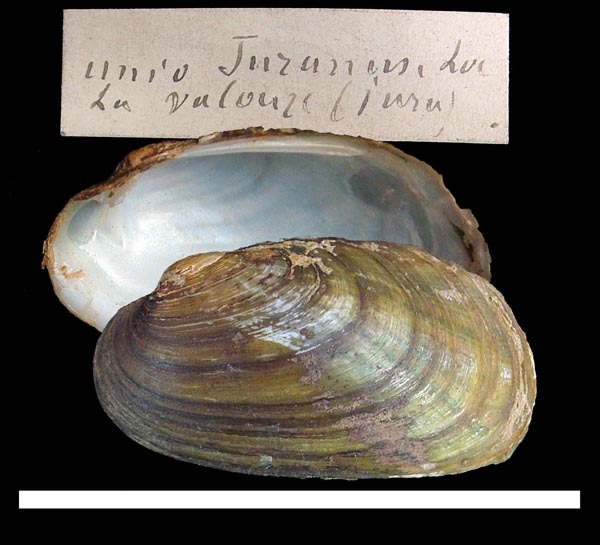 Type(s): LECTOTYPE MNHN_22292 (selected by Graf, 2011), La Valouze (Jura). Locard, 1893, Coqu. Eau Douce Saumâtre France: 173. Germain, 1904, Bull. Soc. Sci. Nat. Ouest France: 262. Locard, 1889, Contr. Faune Malacol. Franc. : 129 , 188 . Locard, 1893, Coqu. Eau Douce Saumâtre France: 157. 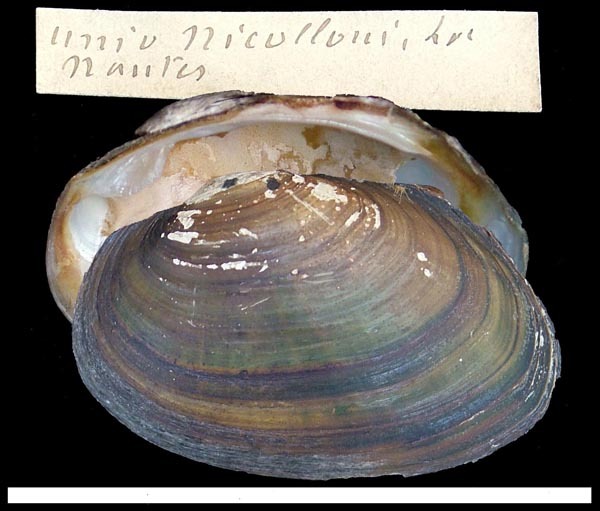 Type(s): HOLOTYPE (MONOTYPY) MNHN_22118, Bahus (Landes). Bourguignat in Locard, 1889, Contr. Faune Malacol. Franc. : 145 , 208 . ‘Servain’ Locard, 1893, Coqu. Eau Douce Saumâtre France: 175, fig. 189. 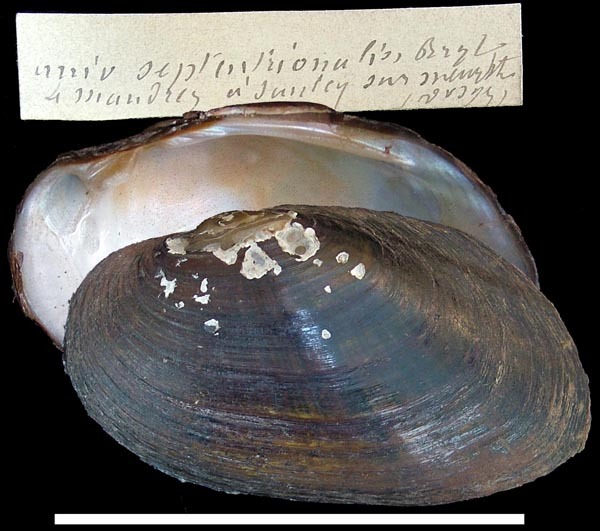 Type(s): LECTOTYPE MNHN_22306 (selected by Graf, 2011), le Reyran (Var). Unio pilloti var. minor Locard, 1889. Locard, 1889, Contr. Faune Malacol. Franc. : 129  [nomen nudum]. Locard, 1889, Contr. Faune Malacol. Franc. : 147 , 217 . Locard, 1893, Coqu. Eau Douce Saumâtre France: 178. Type(s): LECTOTYPE MNHN_22122 (selected by Graf, 2011), La Loire, à Balbigny (Loire). Bourguignat in Locard, 1889, Contr. Faune Malacol. Franc. : 159 , 236  [as ‘mariæ’]. ‘F. Pacome’ Locard, 1893, Coqu. Eau Douce Saumâtre France: 172 [as ‘mariæ’]. 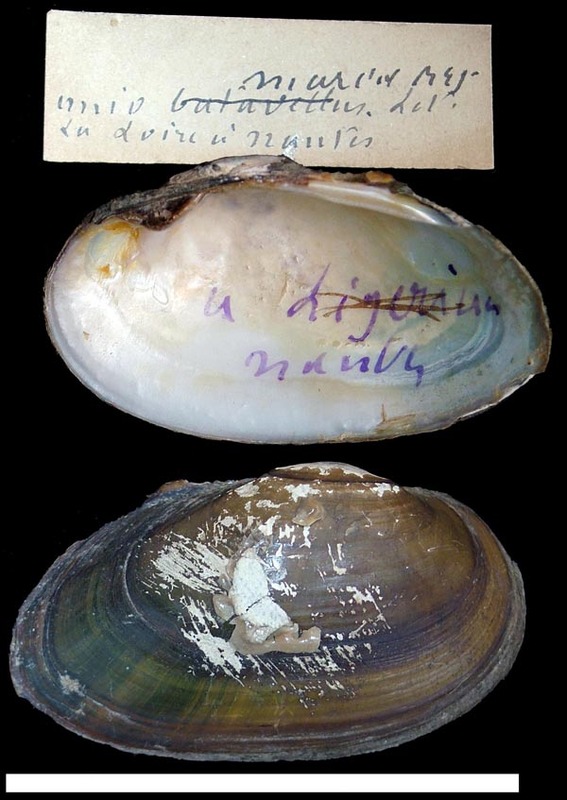 Type(s): IDIOTYPE MNHN_22342, La Loire à Nantes (Loire-Infereur). Unio suborbicularis var. minor Locard, 1889. Locard, 1889, Contr. Faune Malacol. Franc. : 127  [nomen nudum]. Westerlund, 1890, Fauna Paläarct. Binnenconch. : 84 [nomen nudum]. Servain, 1888, Bull. Soc. Malac. France: 317 [nomen nudum]. Bourguignat in Locard, 1889, Contr. Faune Malacol. Franc. : 141 , 206 . ‘Servain’ Locard, 1893, Coqu. Eau Douce Saumâtre France: 172, fig. 186 [as ‘besnardinus’]. 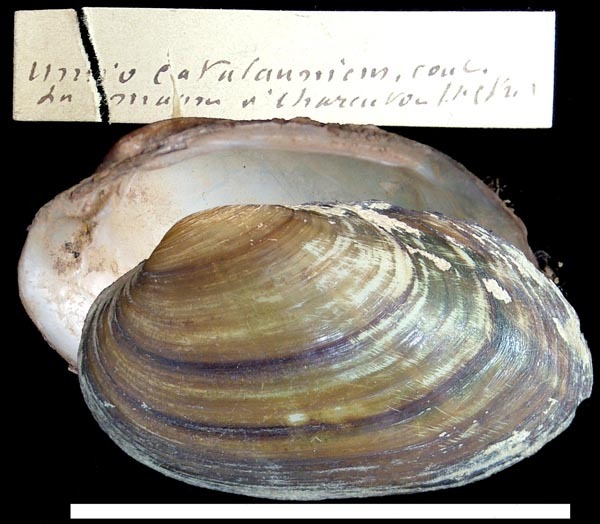 Type(s): LECTOTYPE MNHN_22133 (selected by Graf, 2011), La Loire, à Saint-Gemmes (Maine-et-Loire). Locard, 1889, Contr. Faune Malacol. Franc. : 143 , 203 . Locard, 1893, Coqu. Eau Douce Saumâtre France: 168, fig. 182. Type(s): LECTOTYPE MNHN_22347 (selected by Graf, 2011), la Somme à Abbeville. Unio subrobustus var. curta Locard, 1889. Locard, 1889, Contr. Faune Malacol. Franc. : 135 . Locard, 1889, Contr. Faune Malacol. Franc. : 147 , 216 . Locard, 1893, Coqu. Eau Douce Saumâtre France: 177. Type(s): LECTOTYPE MNHN_22360 (selected by Graf, 2011), La Loire à Balbigny (Loire). Bourguignat in Locard, 1889, Contr. Faune Malacol. Franc. : 159 , 237 . ‘F. Pacome’ Locard, 1893, Coqu. Eau Douce Saumâtre France: 172. Type(s): LECTOTYPE MNHN_22167 (selected by Graf, 2011), Charolles (Saône-et-Loire). Locard, 1889, Contr. Faune Malacol. Franc. : 132 . Locard, 1893, Coqu. Eau Douce Saumâtre France: 159. Germain, 1931, Faune de France: 725. Bourguignat in Locard, 1889, Contr. Faune Malacol. Franc. : 133 , 192 . ‘Coutagne’ Locard, 1893, Coqu. Eau Douce Saumâtre France: 160. Type(s): LECTOTYPE MNHN_22171 (selected by Graf, 2011), La Marne, à Charenton (Seine). Locard, 1889, Contr. Faune Malacol. Franc. : 141 , 200 . 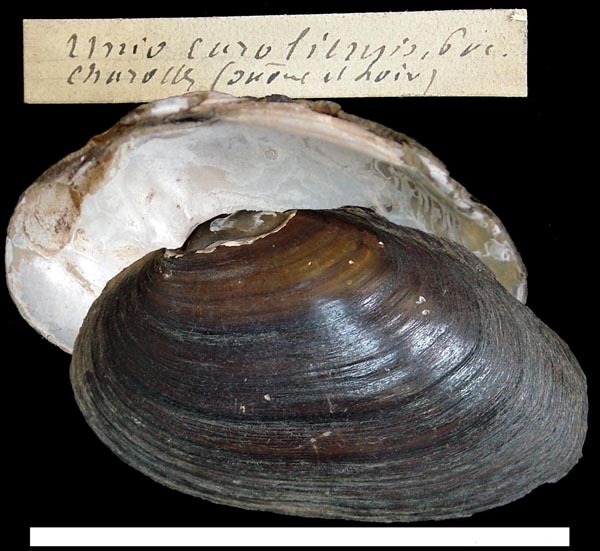 Type(s): HOLOTYPE (MONOTYPY) MNHN_22404, Nantes. Bourguignat in Locard, 1889, Contr. Faune Malacol. Franc. : 145 , 207 . Locard, 1889, Contr. Faune Malacol. Franc. : 138 , 198 . Locard, 1893, Coqu. Eau Douce Saumâtre France: 165, fig. 179. 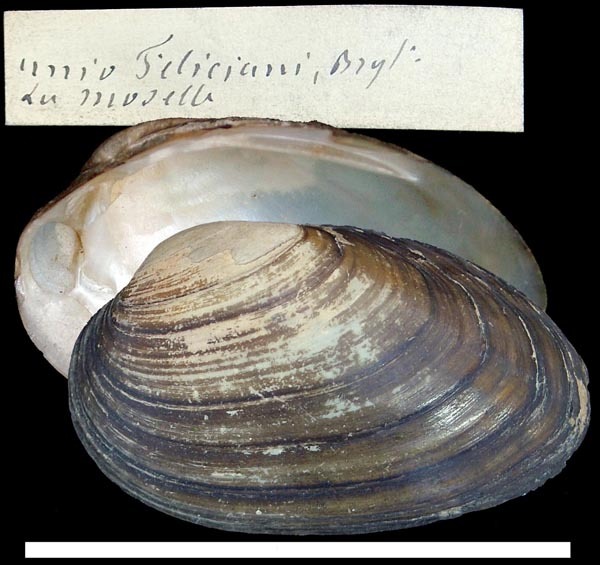 Type(s): LECTOTYPE MNHN_22414 (selected by Graf, 2011), Verpillière (Isère). Bourguignat in Locard, 1889, Contr. Faune Malacol. Franc. : 143 , 201 . ‘Surault’ Locard, 1893, Coqu. Eau Douce Saumâtre France: 169. Type(s): POSSIBLE SYNTYPE MNHN_22192, La Loire à Ingrandes. ‘Bourguignat’ Locard, 1889, Contr. Faune Malacol. Franc. : 149 , 220 . ‘Bourguignat’ Locard, 1893, Coqu. Eau Douce Saumâtre France: 180. ‘Bourguignat’ Locard, 1899, Conchyliol. Portug. : 220. 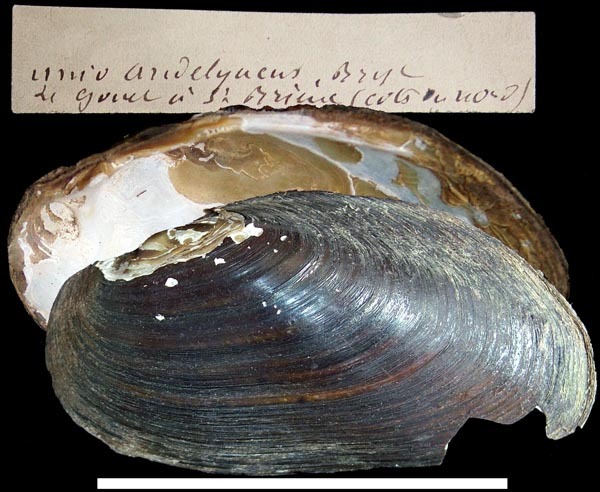 Type(s): LECTOTYPE MNHN_22424 (selected by Graf, 2011), Balbigny (Loire). Locard, 1889, Contr. Faune Malacol. Franc. : 128 . Locard, 1893, Coqu. Eau Douce Saumâtre France: 155. Locard, 1889, Contr. Faune Malacol. Franc. : 138 , 195 . Locard, 1893, Coqu. Eau Douce Saumâtre France: 165. 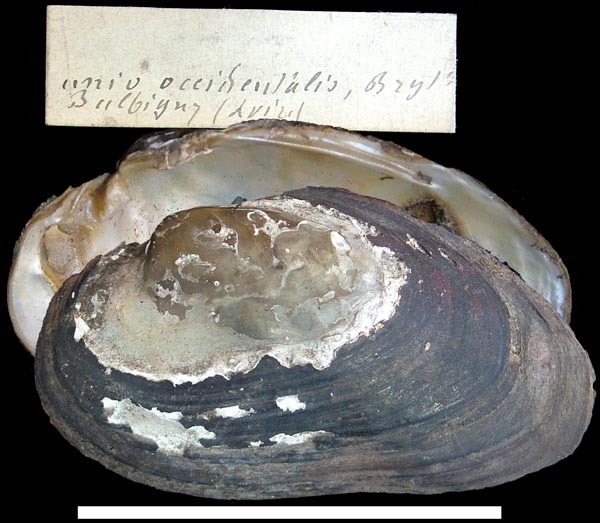 Type(s): LECTOTYPE MNHN_22427 (selected by Graf, 2011), Pentoise (Jura). Locard, 1889, Contr. Faune Malacol. Franc. : 166 , 245 . Locard, 1893, Coqu. Eau Douce Saumâtre France: 203. Type(s): LECTOTYPE MNHN_22202 (selected by Graf, 2011), La Saône à Collonges (Rhône). Drouët, 1889, Mém. Acad. Sci. Dijon: 79, pl. 1, fig. 2. Locard, 1889, Contr. Faune Malacol. Franc. : 143 , 205 . Locard, 1893, Coqu. Eau Douce Saumâtre France: 171. Type(s): IDIOTYPE MNHN_22217, La Marne à Châlons (Marne). ‘Linn.’ Draparnaud, 1806, Hist. Moll. France: 131, pl. 11, figs. 3 [as ‘Unio pictorum var. B’]. ‘Bourguignat’ Locard, 1893, Coqu. Eau Douce Saumâtre France: 174, fig. 187 [as ‘senauxi’]. Type(s): LECTOTYPE MNHN_22523 (selected by Graf, 2011), La Loire à Orléans. Bourguignat in Locard, 1889, Contr. Faune Malacol. Franc. : 146 , 212 . ‘Bourguignat’ Locard, 1893, Coqu. Eau Douce Saumâtre France: 176. 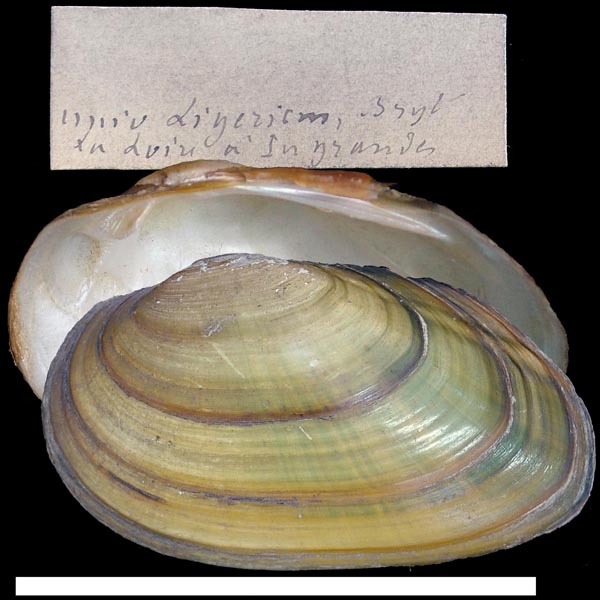 Type(s): SYNTYPE MNHN_22254, La Loire, à Basse-Indre. ‘Thièse’ Locard, 1889, Contr. Faune Malacol. Franc. : 141 , footnote [nomen nudum]. ‘Nilss.’ Drouët, 1857, Étud. Naïades. France, Unio: 72, pl. 4, fig. 1 [as ‘U. ater’]. Bourguignat in Locard, 1889, Contr. Faune Malacol. Franc. : 146 , 213 . Type(s): SYNTYPES MNHN_22270, Le Mandrezey, à Saulcy-sur-Meurthe (Vosges). Locard, 1889, Contr. Faune Malacol. Franc. : 137 , 194 . Locard, 1893, Coqu. Eau Douce Saumâtre France: 163. 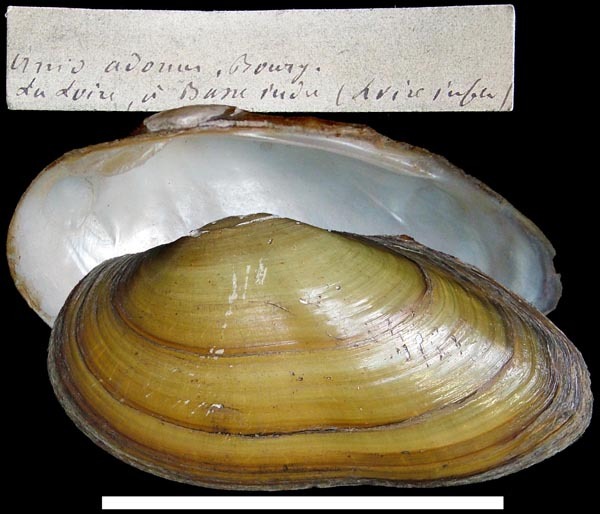 Type(s): SYNTYPE MNHN_22559, La Saône, à Auxonne (Côte-d’Or). ‘Lea’ Paetel, 1890, Cat. Conch.-Samml. : 159. ‘Lea’ Paetel, 1890, Cat. Conch.-Samml. : 156. Unio sieversi var. kobelti Westerlund, 1890. Kobelt, 1886, Icon. Land- und Süssw.-Moll. : pl. 53, fig. 286 [as ‘U. sieversi’]. Westerlund, 1890, Fauna Paläarct. Binnenconch. : 151. ‘Bourguignat’ Locard, 1893, Coqu. Eau Douce Saumâtre France: 174. ‘Servain in Locard’ Locard, 1893, Coqu. Eau Douce Saumâtre France: 174. Locard, 1893, Coqu. Eau Douce Saumâtre France: 174. Type(s): LECTOTYPE MNHN_22098 (selected by Graf, 2011), Le Mans (Sarthe). ‘Servain’ Locard, 1893, Coqu. Eau Douce Saumâtre France: 172. ‘Bourguignat’ Locard, 1893, Coqu. Eau Douce Saumâtre France: 173. Locard, 1893, Coqu. Eau Douce Saumâtre France: 168. Type(s): LECTOTYPE MNHN_22241 (selected by Graf, 2011), La Loire à Nantes (Loire-Infereur). Locard, 1893, Bull. Soc. Sci. Nat. Elbeuf: 1. Locard, 1893, Coqu. Eau Douce Saumâtre France: 170. 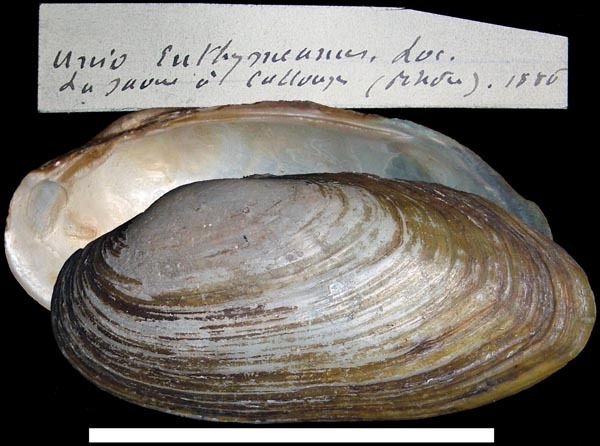 Type(s): SYNTYPE MNHN_22305, le Seine au nord d. Rouen. Drouët, 1898, Mém. Acad. Sci. Dijon: 60, pl. 1, fig. 7. Unio batavus var. major Drouët, 1898. Drouët, 1898, Mém. Acad. Sci. Dijon: 61. Bourguignat in Locard, 1889, Contr. Faune Malacol. Franc. : 140  [nomen nudum]. Bourguignat in Locard, 1899, Conchyliol. Portug. : 218. ‘Spengler’ Simpson, 1900, Proc. U.S. Nat. Mus. : 744. Germain, 1904, Bull. Soc. Sci. Nat. Ouest France: 261 . ‘Bourguignat’ Germain, 1904, Bull. Soc. Sci. Nat. Ouest France: 265 . Unio ater var. irgizlaicus Lindholm, 1904. Lindholm, 1904, Ann. Mus. St. Pétersbourg: 343. Unio batavellus var. perconvexus Germain, 1904. Germain, 1904, Bull. Soc. Sci. Nat. Ouest France: 260 . Unio batavus var. radiata Germain, 1904. Germain, 1904, Bull. Soc. Sci. Nat. Ouest France: 257 . Unio ligericus var. 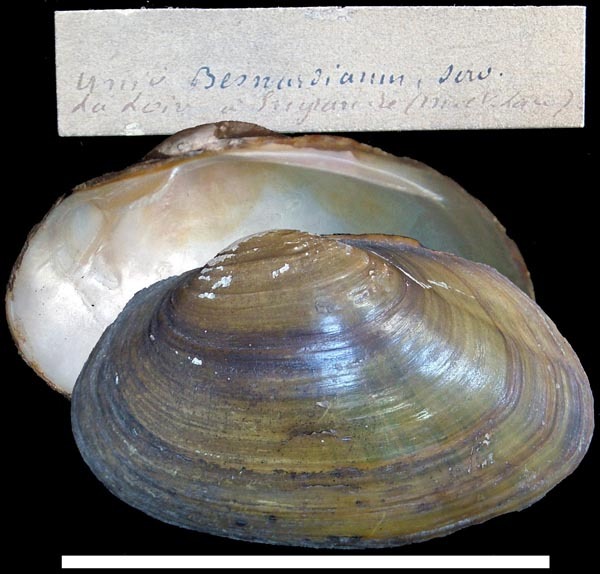 subsinuatus Germain, 1904. Germain, 1904, Bull. Soc. Sci. Nat. Ouest France: 259 . Unio pseudolittoralis var. curonicus Riemenschneider, 1907. Riemenschneider, 1907, Nachr. Bl. Dtsch. Malak. Ges. : 150. Haas, 1908, Nachr. Bl. Dtsch. Malak. Ges. : 175. Haas, 1909, Beitr. Kenntn. Mittleleurop. Najadeen, Beilage zu...: 29. Kobelt, 1910, Icon. Land- und Süssw.-Moll. : 83, pl. 420, figs. 2436-2438. 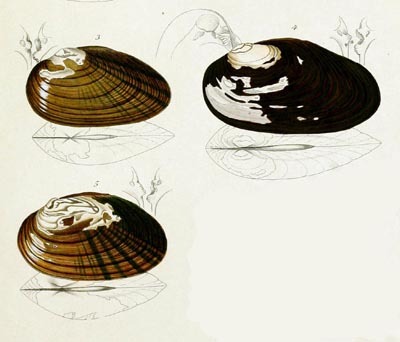 Unio batavus badensis Haas, 1910. Haas, 1910, Mitteleur. Najad., Beiträge Nachr. Bl. Dtsch. Malak. Ges. : 60. 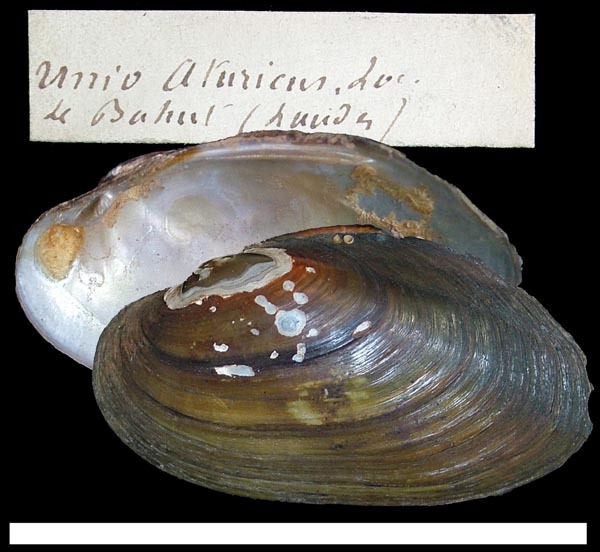 Unio batavus sabulosus Haas, 1910. Haas, 1910, Mitteleur. Najad., Beiträge Nachr. Bl. Dtsch. Malak. Ges. : 59. 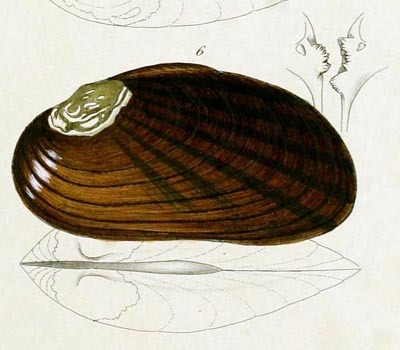 Unio batavus forma elongata Clessin, 1910. Clessin, 1910, Nachr. Bl. Dtsch. Malak. Ges. : 66. Unio consentaneus hohenwarti Kobelt, 1910. Kobelt, 1910, Icon. Land- und Süssw.-Moll. : 78, pl. 418, fig. 2427. Unio consentaneus langi Kobelt, 1910. Kobelt, 1910, Icon. Land- und Süssw.-Moll. : 70, pl. 415, fig. 2414. Unio consentaneus subterminalis Kobelt, 1910. Kobelt, 1910, Icon. Land- und Süssw.-Moll. : 80, pl. 418, fig. 2429. Unio consentaneus thayacus Kobelt, 1910. Kobelt, 1910, Icon. Land- und Süssw.-Moll. : 69, pl. 414, figs. 2410-2411; pl. 415, fig. 2413. Unio (consentaneus var. ?) gallensteini Kobelt, 1910. Kobelt, 1910, Icon. Land- und Süssw.-Moll. : 79, pl. 418, fig. 2428. Kobelt, 1910, Icon. Land- und Süssw.-Moll. : 82, pl. 419, figs. 2434-2435. Unio consentaneus dilatatus Kobelt & Haas, 1911. Kobelt & Haas, 1911, Icon. Land- und Süssw.-Moll. : 18, pl. 453, figs. 2447-2448; 23, pl. 457, fig. 2472. Unio consentaneus elongatus Kobelt & Haas, 1911. Kobelt & Haas, 1911, Icon. Land- und Süssw.-Moll. : 20, pl. 455, figs. 241. 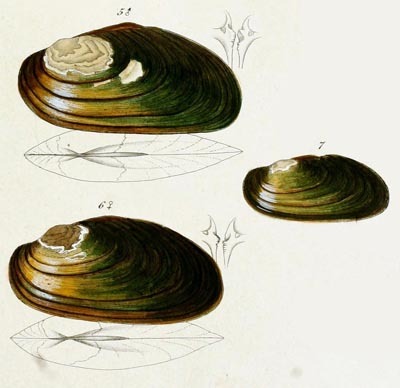 Unio consentaneus marisaensis Kobelt & Haas, 1911. Kobelt & Haas, 1911, Icon. Land- und Süssw.-Moll. : 57, pl. 479, figs. 2559-2562. Kobelt & Haas, 1911, Icon. Land- und Süssw.-Moll. : pl. 479 [caption, as “marisensis”]. 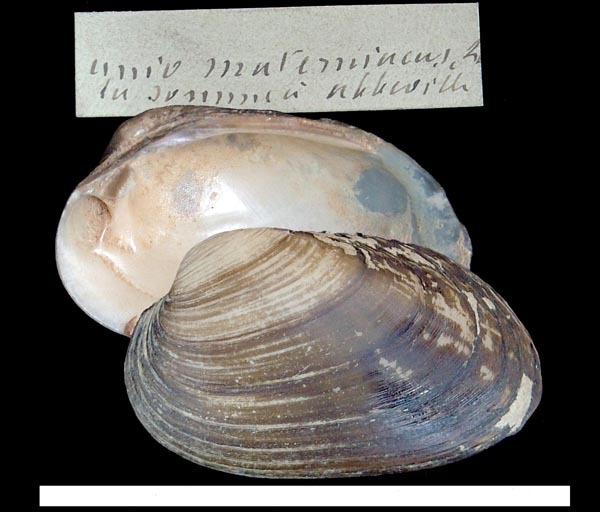 Unio consentaneus marisensis Kobelt & Haas, 1911. Kobelt & Haas, 1911, Icon. Land- und Süssw.-Moll. : pl. 479 [caption]. Unio crassus heimburgi Haas, 1911. Haas, 1911, Verh. Naturhist. Ver. Preuß. Rheinl. : 527, pl. 6, fig. 20. Unio crassus var. okae Kobelt & Haas, 1911. Kobelt & Haas, 1911, Icon. Land- und Süssw.-Moll. : 58, index, pl. 480, fig. 2567. Unio batavus hexameri Haas, 1911. Haas, 1911, Verh. Naturhist. Ver. Preuß. Rheinl. : 526, pl. 4, fig. 2. 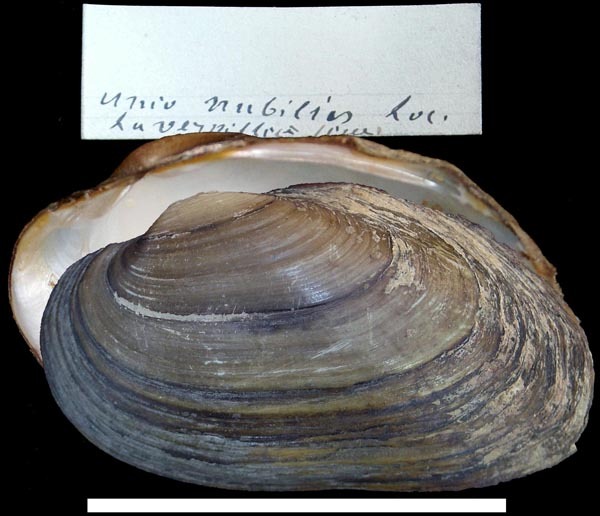 Unio batavus palatinus Haas, 1911. Haas, 1911, Verh. Naturhist. Ver. Preuß. Rheinl. : 525, pl. 4, fig. 3. Unio batavus probavaricus Haas, 1911. Haas, 1911, Verh. Naturhist. Ver. Preuß. Rheinl. : 526, pl. 4, fig. 9. Unio batavus forma pseudoconsentaneus Geyer, 1911. Geyer, 1911, Jh. Ver. Vaterl. Naturkde. Württemb. : 365, pl. 5, fig. 3. Unio consentaneus abnobae Kobelt & Haas, 1911. Kobelt & Haas, 1911, Icon. Land- und Süssw.-Moll. : 23, pl. 458, figs. 2473-2477. Unio consentaneus biandeti Kobelt & Haas, 1911. Kobelt & Haas, 1911, Icon. Land- und Süssw.-Moll. : 22, pl. 457, fig. 2470. Unio consentaneus bodamicus Kobelt & Haas, 1911. Kobelt & Haas, 1911, Icon. Land- und Süssw.-Moll. : 21, pl. 456, figs. 2465-2466. Kobelt, 1912, Icon. Land- und Süssw.-Moll. : 30, pl. 494, fig. 2632. Kobelt, 1912, Icon. Land- und Süssw.-Moll. : 24, pl. 490, figs. 2622-2623. ‘Lea’ Kobelt, 1912, Icon. Land- und Süssw.-Moll. : 37, pl. 530, figs. 2734-2735. Kobelt, 1912, Icon. Land- und Süssw.-Moll. : 27, pl. 492, fig. 2627. Unio batavus distinguendus C. Boettger, 1912. C. Boettger, 1912, Arch. Naturg. : 305, pl. 1, fig. 7. Unio batavus navensis C. Boettger, 1912. C. Boettger, 1912, Arch. Naturg. : 305, pl. 5, figs. 1-3. Unio kungurensis chlebnikowi Kobelt, 1912. Kobelt, 1912, Icon. Land- und Süssw.-Moll. : 26, pl. 491, fig. 2624. Unio kungurensis irenjensis Kobelt, 1912. Kobelt, 1912, Icon. Land- und Süssw.-Moll. : 26, pl. 491, fig. 2626. Unio kungurensis sylwensis Kobelt, 1912. Kobelt, 1912, Icon. Land- und Süssw.-Moll. : 26, pl. 491, fig. 2625. Unio batavus kobeltianus Haas, 1913. Haas, 1913, Nachr. Bl. Dtsch. Malak. Ges. : 105. 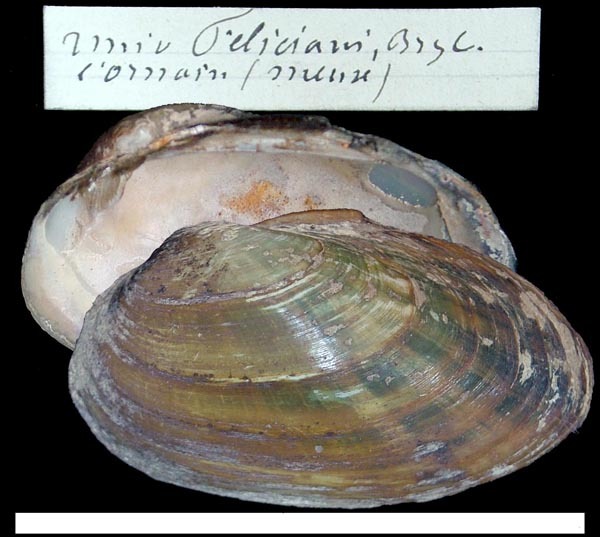 Unio crassus thuringiacus Israel, 1913. Israel, 1913, [in] Thüring. Lehrerverein Naturk. : 28, pl. 6, figs. 4-6. Bourguignat in Servain, 1888, Bull. Soc. Malac. France: 317 [nomen nudum]. Kobelt, 1913, Icon. Land- und Süssw.-Moll. : 48, pl. 534, fig. 2749. Simpson, 1914, Descr. Cat. Naiades: 732. Unio crassus polonicus Polinksi, 1917. Polinksi, 1917, C. R. Soc. Sci. Varsovie: 902, pl. ? ?, figs. 1, 3. Unio crassus subsp. ornatus Polinksi, 1917. Polinksi, 1917, C. R. Soc. Sci. Varsovie: 904, pl. ? ?, fig. 2. Unio cantianus Kennard & Woodward, 1924. Kennard & Woodward, 1924, Proc. Malac. Soc. London: 136, text figs. 8-9. Rosén, 1925, Arch. Moll. : 116-121 ??. ‘Pacôme’ Germain, 1931, Faune de France: 728. Unio courtilieri ‘Hattemann’ of Authors. ‘Hattemann’ Germain, 1904, Bull. Soc. Sci. Nat. Ouest France: 256 . ‘Hattmann’ Germain, 1931, Faune de France: 724, 727. ‘Locard’ Germain, 1931, Faune de France: 727. ‘Bourg. in Loc.’ Germain, 1931, Faune de France: 727. ‘Servain’ Germain, 1931, Faune de France: 728. Unio mingrelicus var. stevenianiformis Zhadin, 1938. 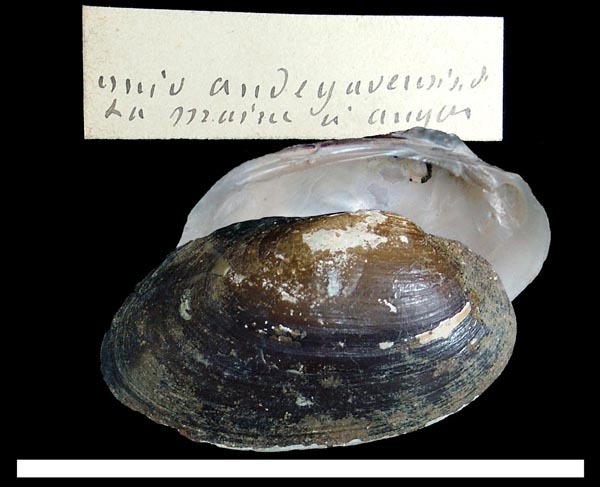 Zhadin, 1938, Faune USSR Mollusques: 96, text fig. 28. Unio raddei var. kutaisiana ‘Kobelt’ of Authors. Zhadin, 1938, Faune USSR Mollusques: 94. Zatravkin, 1987, Byull. Mosk. Obshch.. Ispyt. Prir. : 49. 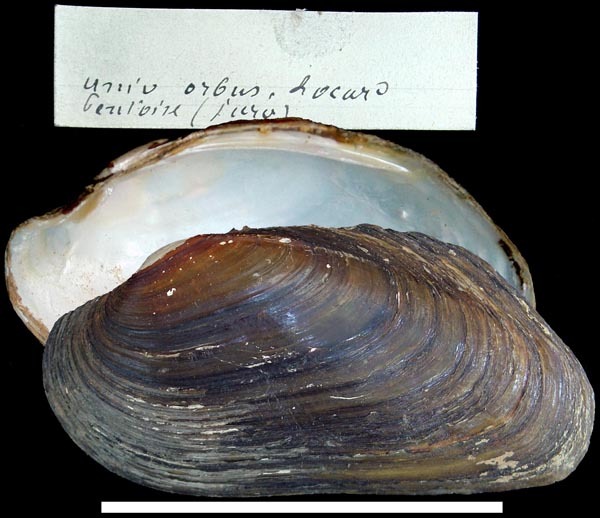 Unio crassus consentancus Zhadin, 1938. 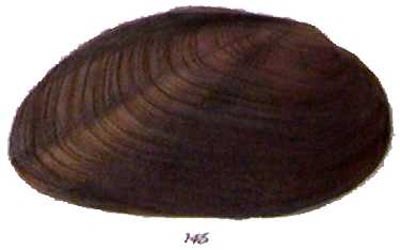 ‘Ziegler’ Zhadin, 1938, Faune USSR Mollusques: 91. Unio crassus var. chlebnikovi Zhadin, 1938. ‘Kobelt’ Zhadin, 1938, Faune USSR Mollusques: 89. Unio crassus var. ishmensis Zhadin, 1938. Zhadin, 1938, Faune USSR Mollusques: 160. Unio crassus var. stepanovi Zhadin, 1938. ‘Drouët’ Zhadin, 1938, Faune USSR Mollusques: 90. Unio (Limnium) diabekirianus Pallary, 1939. ‘Kobelt’ Pallary, 1939, Mém. Inst. Égypte: 120. ‘Kobelt’ Haas, 1940, Zool. Ser. Field Mus. Nat. Hist. : 132. ‘Bourguignat’ Haas, 1940, Zool. Ser. Field Mus. Nat. Hist. : 131. Unio kungurensis sylvensis Haas, 1940. ‘Kobelt’ Haas, 1969, Das Tierreich: 53. Unio raddei var. kutaisanus Haas, 1940. ‘Kobelt’ Haas, 1940, Zool. Ser. Field Mus. Nat. Hist. : 131. ‘Locard’ Haas, 1969, Das Tierreich: 51. Unio raddei var. koutaisanus Haas, 1969. ‘Drouet’ Zatravkin, 1983, [in] I.M. 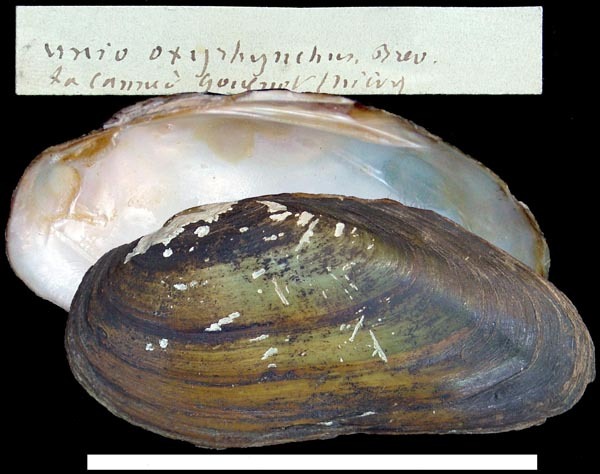 Likharev, Molluscs: 40. ‘Drouet’ Zatravkin, 1987, Byull. Mosk. Obshch.. Ispyt. Prir. : 49. Unio crassus var. irgislaicus Zatravkin, 1987. ‘Lindholm’ Zatravkin, 1987, Byull. Mosk. Obshch.. Ispyt. Prir. : 57. Unio mingrelicus var. stevenianiformes Zatravkin, 1987. ‘Shadin’ Zatravkin, 1987, Byull. Mosk. Obshch.. Ispyt. Prir. : 56. ‘Kyrnicky’ Bába, 2000, Boll. Malac. : 135. Crassiana mengrelica Kantor et al., 2010. ‘Drouët’ Kantor et al., 2010, Cat. Contin. Moll. Russia: 260. Unio inflatus Locard 1881 . Unio platyrhynchoideus de Cessac . Unio coactatus Ziégl. in sched. .
Ziégl. in sched. Of Authors.